Joom Beem’s mats are designed for use for homes, schools, gyms, and clubs. 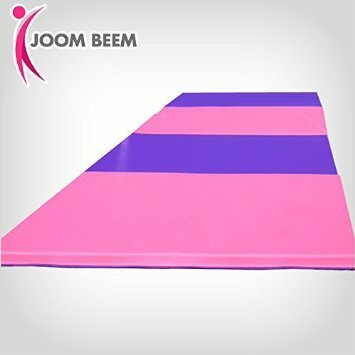 While designed and made with the needs of young gymnasts in mind, Joom Beem mats can be used for a wide variety of activities such as dance and martial arts. Each of our 4’ x 8’ mats can fold into 4 panels for easy transportation. Our mats have 1 3/8” polyurathane foam filler, 18-ounce vinyl over nylon non-slip cover that is also fire retardant, puncture and mildew resistant. Joom Beem mats also have Nyoplast bottoms to prevent slippage and feature slim Velcro panels on each end for connecting additional mats.